We’ve been so bad at Christmas baking this year. 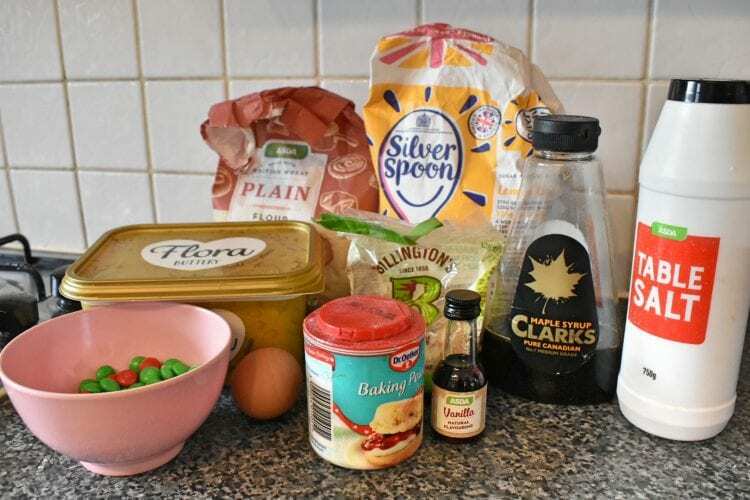 I’ve been creating bits and bobs, but me and Michael haven’t really done a proper fun baking day that he can help with. So, we decided to make some Christmas Cookies. 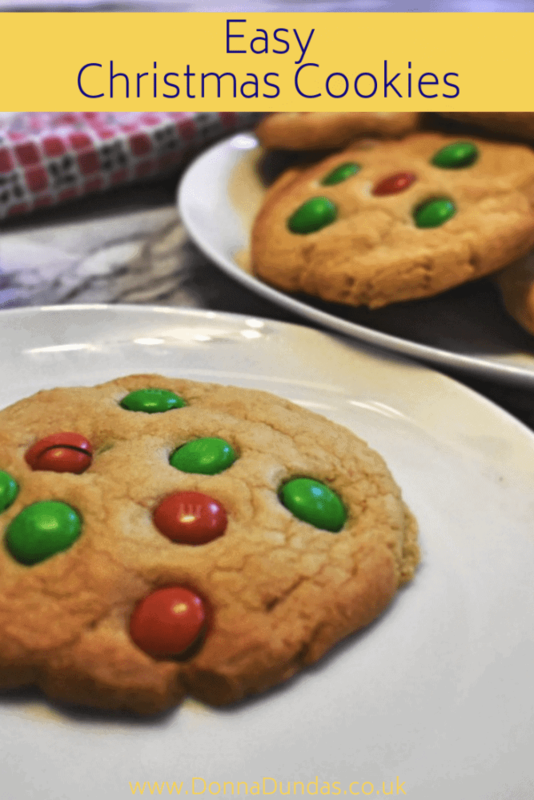 They are basically the same as my chocolate chip cookies but with red and green m&m’s. We popped to our local store on our way back from a lovely Saturday morning at the library, so we didn’t have much choice. 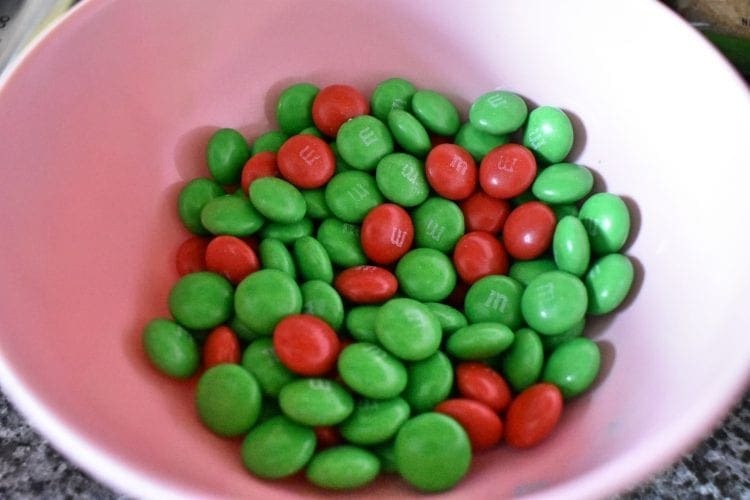 I bought two big share bags of regular chocolate m&ms, figuring I could just pick out the red and greens ones and eat the rest…shared with the family of course! But, I’m pretty sure they do festive bags that only have red and green, so even better if you get those. Picking them out of the pack proved that m&ms don’t seem to like reds! There was a lot more of all of the other colours, in both bags! 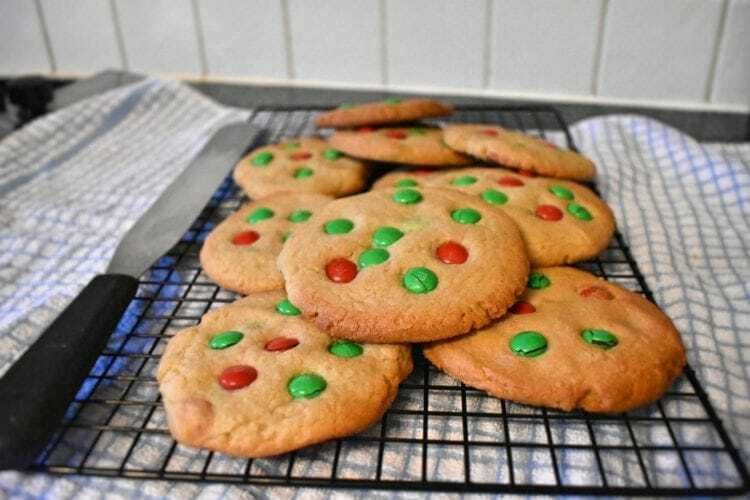 It didn’t quite give us enough to do 12 big cookies, so we’ve got 10 Christmas Cookies and two m&m cookies with all colours in. Preheat the oven to 160 degrees and lightly grease a baking tray. Two if you’ve got them. Tip the sugars into a large mixing bowl and add the melted butter. Mix these together. Weirdly, Michael didn’t like the smell of this mixture. He announced that he wasn’t licking this bowl. Safe to say it hasn’t put him off eating all of the cookies though! Add the egg, maple syrup and vanilla and stir well. 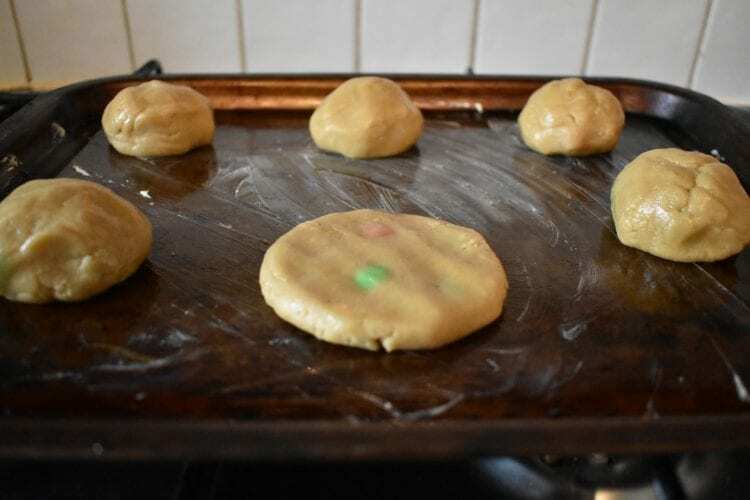 Add half of your m&m’s and stir until evenly spread. 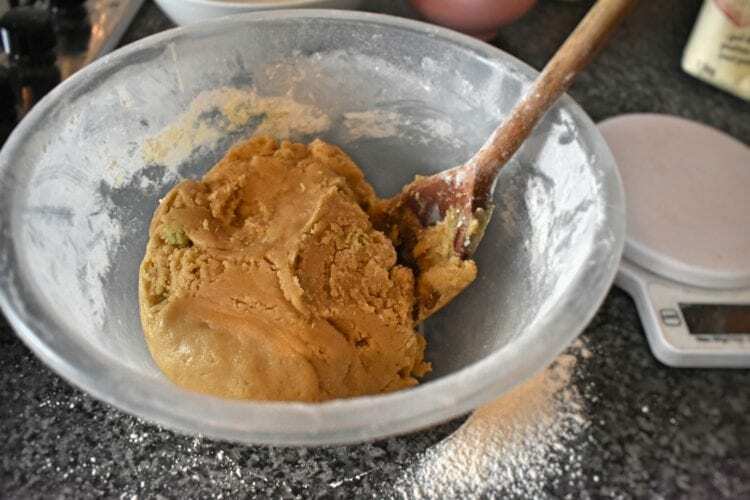 Weigh the flour out with the baking powder and salt and sift in. 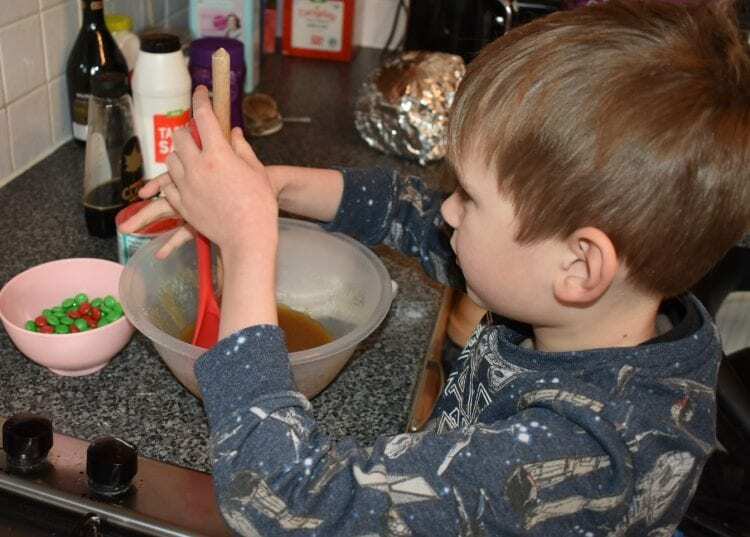 Using a wooden spoon mix well. Really digging down until it forms a smooth ball of dough. It will be dryish, but greasy to touch. Michael refused to touch, which is weird because he usually likes mess and stickiness. Roll into 12 equal balls and place on a baking tray. They do grow quite a bit, so I do six on each tray, leaving plenty of space between them. Gently press down, so they are round and cookie-like, still leaving space for them to spread. Press in the rest of the m&ms. Place in the oven and bake for 12 minutes for a soft and chewy cookie or 15 minutes for a crunchy Christmas cookie. Leave to cool on a wire rack, but I’d eat one warm, they taste amazing! 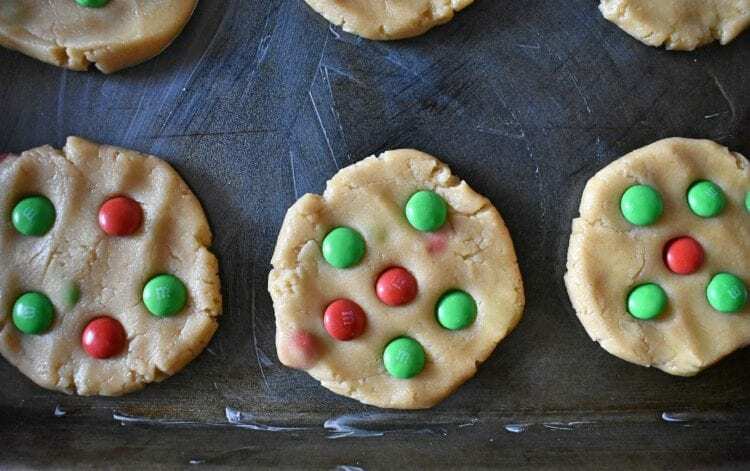 Super simple cookies with a Christmas twist! Thanks, it is super simple, the best cookies ever too! omg what is this magic?! I didn’t know they existed! I have to be simple, I’m not very neat! Hope you like them!